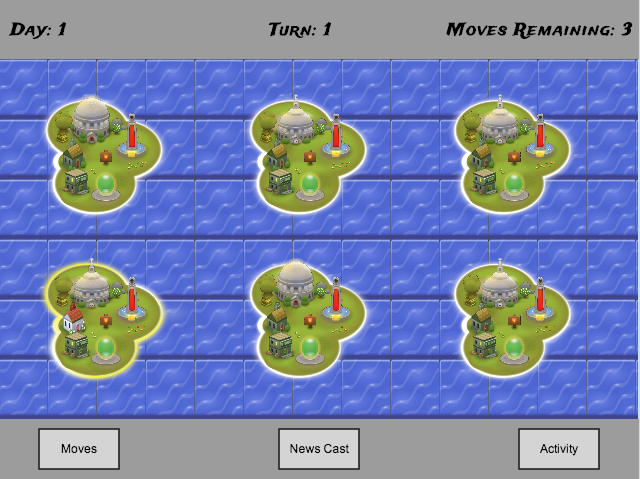 Island World is a turn-based strategy game where users control resources on an island and compete to survive against other islands while confronting natural disasters. I designed and developed the initial game prototype as part of a data elicitation research project for the Department of Homeland Security. Each year, millions of individuals migrate from their homes. Unfortunately, a large number of people migrating within a limited timeframe can cause social and economic disruption for both the communities that the people are leaving and entering. Existing scholarship describes how social and economic drivers affect human migration behavior. However, we lack an understanding of the effect of environmental drivers such as earthquakes and famine, due to inherent challenges present when attempting to collect the necessary data. Accurate accounts of what transpired are difficult to obtain since this data tends to be post-hoc rationalizations for the choices of individuals long after the migration occurred. This research argues that virtual experimentation can mitigate many of these challenges and supplement current data gathering techniques to further our understanding of environmental stressors in influencing human migration behavior. We designed a turn-based game called Island World, which allows researchers to observe how individuals react under different stressor situations via the game. Researchers can run behavioral experiments in which they control for outside influences and decide when natural disasters should strike a player’s island. My role was to design and develop a first prototype of Island World. The focus for the first prototype was to demonstrate the viability of testing the research hypothesis; therefore, I chose a high enough fidelity that enabled researchers to imagine realistically interacting with the game, but also a low enough fidelity that it was clear it was a prototype. Jennifer Stoll, Ian Malave, Matthew Campbell, Christy L. Crosiar (2014). Island World: Online Gaming as Secondary Data Elicitation for Predictive Migration. Proceedings of the International Conference on Game and Entertainment Technologies, Lisbon, Portugal, 15-19 July.